We invite you to explore Lake of the Woods the River Bend Way. If you are looking to hike, birdwatch, or wander the beach as the weather warms up, even a girls gone fishing trip, River Bend is the place for you! Our 6th Annual Ladies Only Fishing Tournament is quickly approaching! Get your girls together for a girls gone fishing getaway and enter to win a prize for the best-dressed guide, best-decorated boat, and best dressed, as well as lawn game winners! Your girls gone fishing weekend will begin with a meeting on Friday, June 1 at 6 pm, explaining rules and regulations for the tournament that will officially start on Saturday, June 2nd. 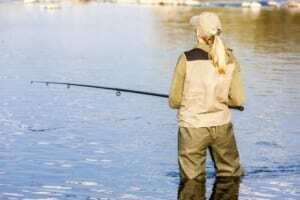 Don’t limit your girls gone fishing weekend at the fishing tournament! Take Sunday to explore Zippel Bay park; you can see four species of lady slippers and a variety of other orchids along the park’s trails. Each year, visitors discover the park’s blueberries, cherries, cranberries, wild strawberries and edible mushrooms. With twenty-five miles of hiking trails and twenty-seven miles of horseback riding trails exploring the beautiful northern shores. For a little more extreme trail riding we have two hundred and thirty-eight miles of trail for class 1 and 2 ATVs as well as motorcycles. After a day of trail riding and hiking, come back and relax in our newly remodeled lodge and enjoy a nice meal at our restaurants. If you’re lucky, you may see the endangered piping plover making their home near the beach. Zippel Bay park is one of the top birding parks in Minnesota. Located on the southern shore of Lake of the Woods, this park encompasses a wide variety of bird habitats. In addition to the endangered piping plover, you can find ducks, pelicans, cormorants, sandhill cranes, herrings, Ring-billed, Franklin’s and Bonaparte’s Gulls. Bald eagles nest near the park and osprey can be seen along the lake. You can hear Sandhill cranes almost every day from spring to fall as they nest in the park.